In 1970, Jeffrey Kagel walked away from the American dream of rock 'n' roll stardom, turning down the chance to record as lead singer for the band soon-to-be the Blue Oyster Cult. Instead, he sold all his possessions and moved from the suburbs of Long Island to the foothills of the Himalayas in search of happiness and a little-known saint named Neem Karoli Baba. 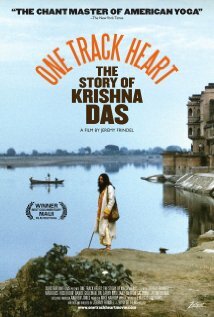 ONE TRACK HEART: THE STORY OF KRISHNA DAS follows his journey to India and back, witnessing his struggles with depression and drug abuse, to his eventual emergence as Krishna Das, world-renowned spiritual teacher and chant master. Featuring interviews with Ram Dass (LSD Icon Richard Alpert), Rick Rubin (Grammy Award winning Producer), Sharon Salzberg (NY Times bestselling author), Daniel Goleman (two-time Pulitzer Prize nominee), as well as a musical score by J Mascis (Dinosaur Jr) & Devadas, this is the inspiring story of how one man's heart-expanding journey continues to transform countless lives.